Dimensions 0.25 by 5 by 6.50 in. Amazon.com description: Product Description: Few would argue with the fact that, on many fronts, we are a world in crisis. And there are two sides to every crisis, be it a leadership crisis, an economic crisis, an education crisis, or a moral crisis. The two sides to crisis are danger and opportunity. 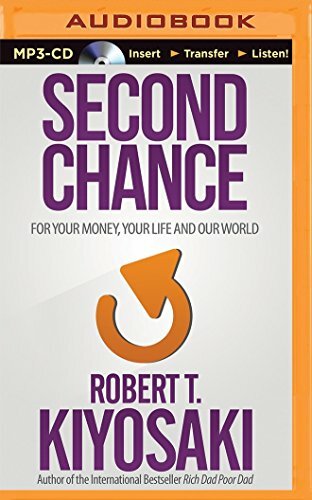 Robert KiyosakiÃ¢ÂÂs new book, Second ChanceÃ¢ÂÂ¦for Your Money, Your Life and Our World, uses the lessons from the past and a brutal assessment of the present to prepare readers to seeÃ¢ÂÂand seizeÃ¢ÂÂthe future. If readers can train their minds to see what their eyes cannot, in a world that is becoming increasingly more "invisible" and moving at a high rate of speed, they can have a second chance at creating the life theyÃ¢ÂÂve always wanted. The global problems we face cannot be solved by the same minds and people who created them and todayÃ¢ÂÂs world demands the ability to see the future and prepare for what lies aheadÃ¢ÂÂ¦prepare for the opportunities as well as the challenges. Like it or not, we are all involved in the greatest evolutionary event in human history. The Industrial Age is over and the Information Age continues to accelerate. The visible agents of change have become invisibleÃ¢ÂÂ¦and harder to see. And the future belongs to those who can train their minds, use the past to see the future, and take the steps to create the positive change they want to see in their lives. Second Chance is a guide to understanding how the past will shape the future and how you can use Information Age tools and insights to create a fresh start. This book is a guide to facing head-on the dangers of the crises around usÃ¢ÂÂand steps and tips for seizing the opportunities they present.